Cruising in Turkey appeals to all your senses. Enjoy, explore, relax! The phrase “ Blue Cruises” was coined back in the 1920’ when a Turkish author I Bodrum took his visiting friends sailing along the “Turquoise Coast” from Bodrum to Antalya. This coast-line offers an enormous diversity with everything from secluded bays to busy towns and sleepy little hamlets. It varies endlessly from vertical mountainsides tumbling into the sea like in a Norwegian fjord to red cliffs, thick with pine trees, which could just as well have been in Scotland . . . and almost anything in between. 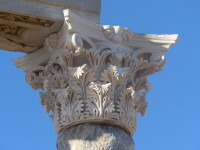 The culture of Turkey is is also rich and diversified. Like any other Mediterranean country, it was conquered by many armies and and influenced by many ethnic groups. It was an important part of the Greek Empire and you will find more than 2000 year old ruins of temples and cities on any headland and promontory. Later the Romans moved in, built more temples and amphitheaters and in 1453 Constantinople – now Istanbul – fell to the Ottoman Empire which lasted until 1922 when the new Turkish republic was declared. There are lots of things to do and the options for yacht charters are very diversified. Do you have a multi-generational family trip with 30 people or are you a group of friends looking for a special bicycle vacation? Has the members of your yoga class decided to combine exercise with natural beauty or would you like to learn more about the fabulous Turkish cuisine? Almost anything is possible! Apropos food! It is with good reason that the Turkish kitchen has been voted the 3rd best in the world after the French and Chinese. Anything from tasty starters to amazing desserts. It is based on fresh vegetables, fish, meat and dairy products. The preparations are meticulous and you will hear your chef chopping away from dawn to dusk. And what about mixing some Greek flavors into your Turkish adventure? Some of the Greek islands are only a few miles away from the Turkish coast so you can explore these as well. 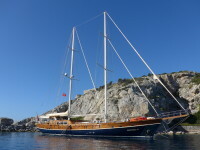 As the right setting for your Turkish adventure, we highly recommend sailing on a gulet. These beautiful yachts have developed from simple sponge divers’ work-boats, but today they boost any comfort you could ever want. They boast amazing craftsmanship and are a study in perfect varnish work. Huge cabins and oceans of space on deck is a given . . . and your crew will pamper you endlessly! The season is roughly from May to October. July and August are the busiest months – and the hottest by far – but in September you have all the advantages of tranquil anchorages pleasant air temperatures and the water is warm enough to spend hours swimming and snorkeling. We have teamed up with the best local agent who will make sure that everything works smoothly and you will always have a a reliable English speaking contact at hand. They will organize your transfers and will also be helpful with selecting hotels if you are staying another couple of days to soak up the local atmosphere. …..an amazing adventure is waiting for you! CONTACT US NOW! !